How did one NAVIS client see $47,000 in increased no-show revenue? Find out by reading the full case study. 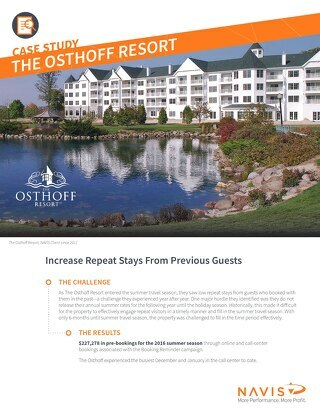 See how the Osthoff Resort increased repeat stays from past hotel guests. 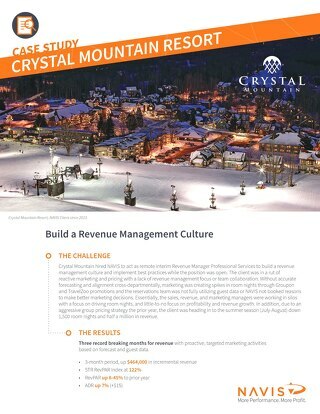 Learn how one NAVIS client built a revenue management culture, deployed NAVIS services, and saw a $464,000 gain over three months after partnering with us. Read the full case study. 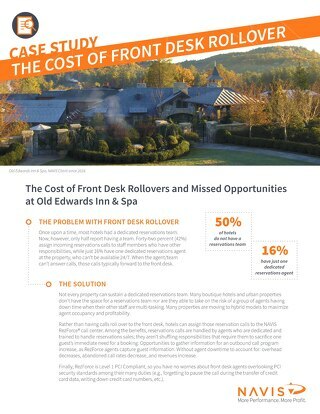 Did you know that 50% of today's hotels do not have a dedicated reservation sales team? Find out why this strategy could be costing you, and hurting the guest experience. Read our case study for more. 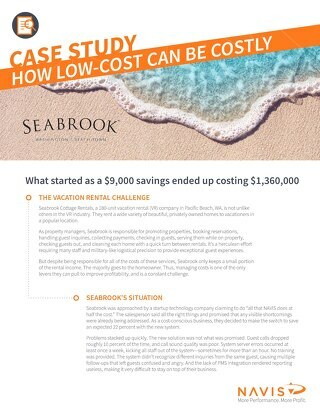 For seasonal resorts and vacation rentals, maximizing revenue per-booking during the high season is a must. 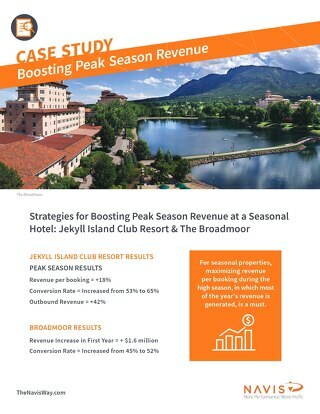 Get more information on how to boost revenue during high season. Read the case study. 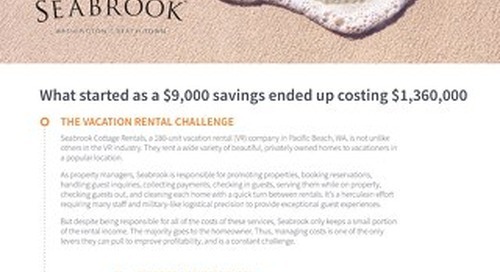 Learn how NAVIS helped a call center manager take her resort property to new heights by implementing our services and solutions for reservation sales and marketing. Get a dedicated client support person (Client Advocate) for training, implementation, and ongoing support needs with NAVIS reservation sales, marketing and analytic solutions and services. 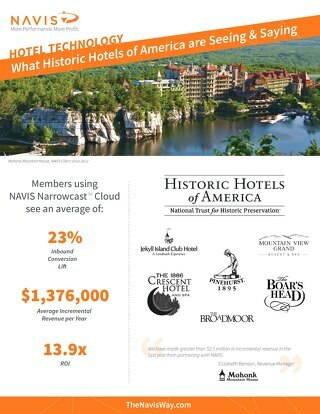 See why Historic Hotels Of America properties have seen a 23% inbound conversion lift with NAVIS Reservation Sales software and services. 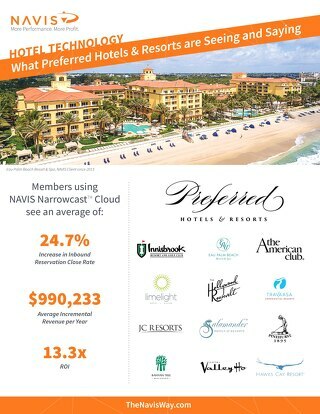 See how your hotel or vacation rental business can improve your reservation sales team success, and transform your agents from order takes to sales makers with NAVIS Narrowcast. Read the case study. Read our case study on the possible downfalls of going with a not-so-transparent reservation sales competitor. 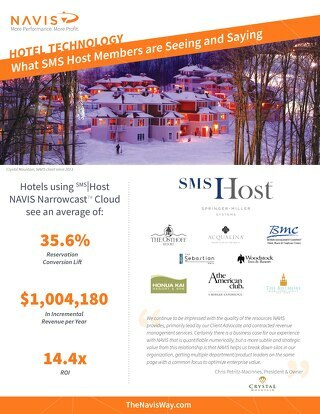 See why NAVIS is the right choice for your reservation sales team.